As I slow my own hurried steps to regard these feet, I am aware that just across the stairway landing is a reproduction of a section of the Grünewald altarpiece, the original of which is installed in the Unterlinden Museum in Colmar, France. Painted by Maria Gabankova, the reproduction is clearly visible from where I stand in front of the Robinson sculpture. The altarpiece is famously richly coloured and distressingly realistic: again, it is the feet I focus on, the twisted, tortured feet of the crucified Christ, wide and calloused peasant feet that have never known shoes. 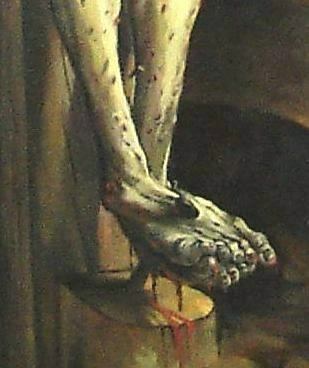 These feet do not dangle: instead, the are cruelly skewered by a huge spike to a crude foot rest mounted on a cross that is bowed by its terrible burden. The bleeding feet of Jesus force me to see Robinson’s preacher’s feet in a new way. The suffering preacher in his pulpit stands with the One whose story he is telling. 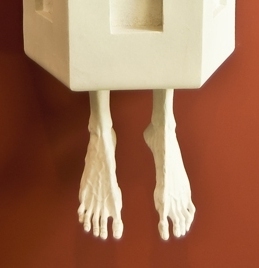 I realize I notice these feet, now, because I also notice my own. For years and years I scarcely thought about my feet - then they begun to speak to me. The podiatrist shows me a model, explaining the source of my pain, and I gasp at the intricacy of the bone structure that had supported my comings and goings all these years. How beautiful they are, I think those slender bones. How tragically slender and multi-jointed. How beautifully crafted and wonderfully made. No doubt, Jesus felt such wonder (and more, for he had created those structures in the first place) as he washed his disciples’ feet that night just before that first Good Friday.And now I begin to grasp something, something that slides away even as I try to articulate it: feet – Jesus’ feet, Robinson’s preacher’s, mine; the feet of all the people who are carrying good news as they dig gardens, raise children, make meals; as they write poems, make films, tell stories; as they preach the Word, plant churches, teach, sit in government and corporate offices – all are insistent reminders that we carry out our tasks in a vulnerable humanity shared with each other, and with him. In the Incarnation, God came and walked among us, feeling the warmth of the good earth, the tiredness of a day’s standing at the workbench or of walking in the thick dust of Palestinian roads. 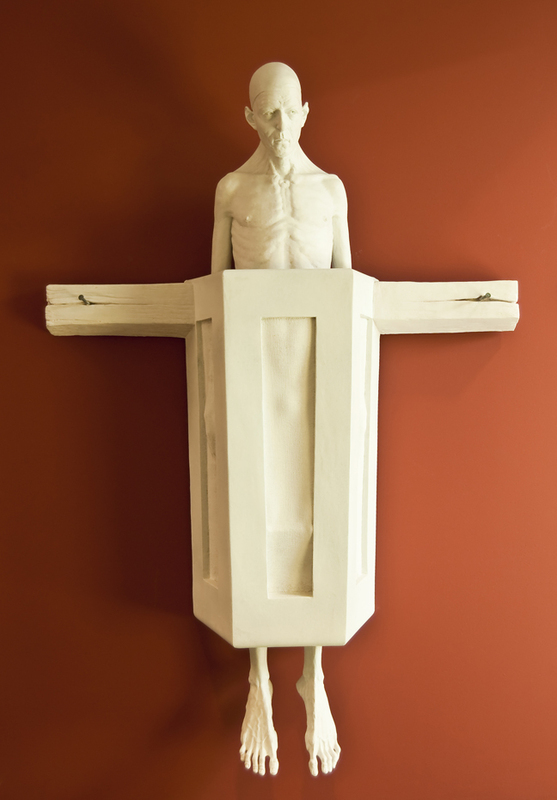 As the writer of the Letter to the Hebrews puts it: “We do not have a high priest who is unable to sympathize with our weaknesses…” By virtue of those feet having once been nailed to a cross, we are connected not only to earth but also to God’s very self, drawn into the life and love of the Trinity. All that touches us also touches him. Maxine Hancock is Professor of Interdisciplinary Studies and Spiritual Theology at Regent College. David Robinson(b. 1964). His work can be found in many high profile collections across Canada, and he has been commissioned to produce a multitude of large-scale public and private works. See www.robinsonstudio.com. Images: Top: David Robinson: Speak. Middle left: Maria Gabankova: Isenheim Altar by Grünewald detail; Middle right: David Robinson: Speak detail. Published in The Regent World 21, 2 , 2009. It appears here courtesy of Regent College, Vancouver B.C., Canada.